Of the two games in the horror series slated for 3DS, Resident Evil: The Mercenaries 3D is at first blush the least interesting. 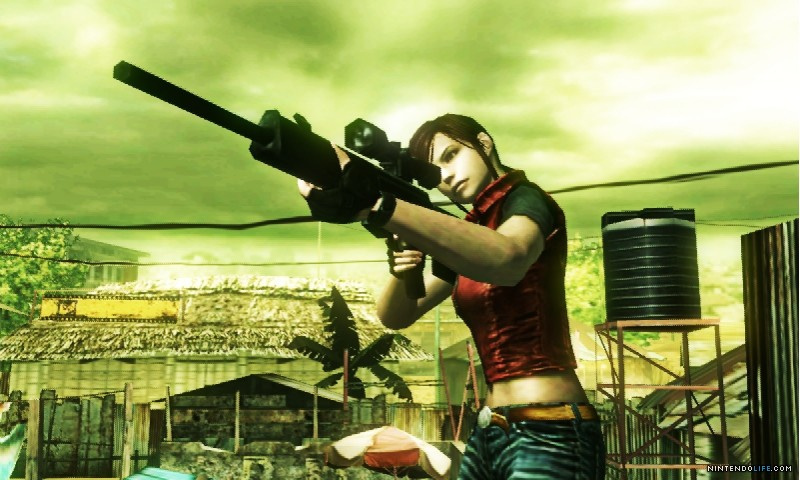 Where Resident Evil: Revelations looks to be taking the atmosphere back to the series’ spooky roots, Mercenaries is a complete embracement of the third-person shooting action of the franchise’s modern entries. 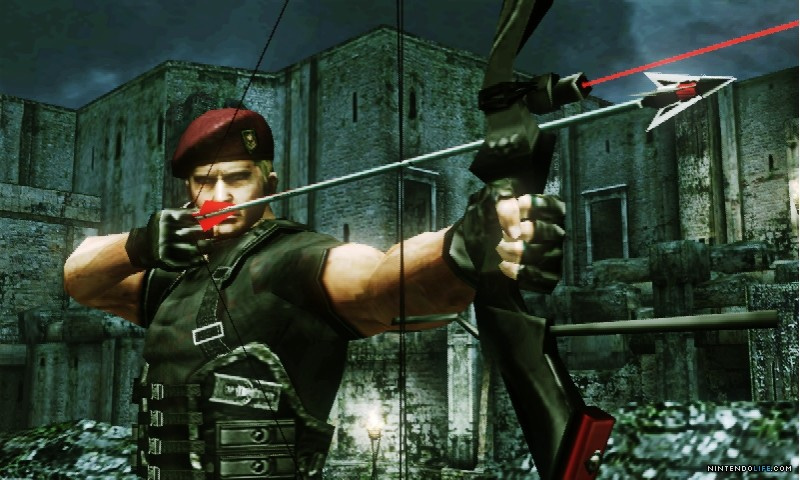 What’s not so interesting about it is its lack of mystique; Mercenaries is something players of Resident Evil 4 and 5 likely know and have already experienced through its inclusion as a bonus mode in those games. It remains to be seen whether the bonus mode can stand on its own two legs when it’s released sometime in the 3DS’s launch window, but the two-stage, four-character demo on offer in New York City last Wednesday proved that, yep, the concept itself is still really fun. Mercenaries is essentially a horde/survival game where you’re given a small arsenal, a good-sized arena and lots of things trying to murder you silly. You have two minutes to cause as much mayhem and rack up as many skill points (used for upgrades) as possible through kills and combos, and time can be extended by knocking over light-up totems for an extra 30 seconds or performing finishing moves on downed foes for an extra 5 seconds. The game promises to be a compilation of sorts of Resident Evils 4 and 5, and we were able to play through one stage pulled from each. Enemies on offer were faithful to their game of origin, with majini flooding an African settlement and hooded Illuminados haunting the streets of a small Eastern European village. Whether environments from earlier games will be included remains to be seen, it’d be a shame if the Raccoon City Police Department or original mansion were left out of the fun. 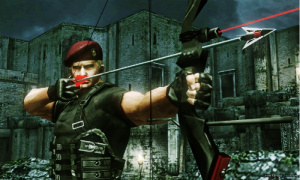 Each of the four characters in the demo each had their own special weapons loadout: Chris Redfield brandished a shotgun, Claire Redfield had a handy rifle, Hunk mowed with a machine gun, and Krauser was all Kraven with a knife and crossbow. An assortment of grenades, flashbangs and health items were snaggable around the stages, and of course strategically placed big red exploding barrels helped dispatch multiple foes at once. 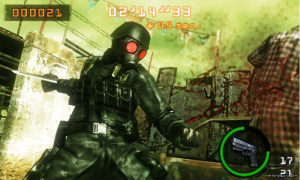 Controls work pretty much the same as post-4 Resident Evils, meaning slightly lumbering third-person movement with lots of stopping to aim by holding down L to bring up your weapon and firing with Y. One small-yet-important addition is the ability to move and shoot simultaneously, done by holding down both shoulder buttons. You can’t aim up or down doing this, though; your aim is locked into place, but you can move forward, backward and sidestep with the circle pad. The slight agility boost, coupled with the handy quick-turn, is very welcome and helps minimize the somewhat lumbering feel. A mobile version of Capcom’s flexible MT Framework engine powers the game and really makes everything look quite stunning in 3D. It’s closer to RE4 than RE5 in detail, but the added stereoscopic effect goes a long way for maintaining immersion and stays smooth throughout. Capcom promises online co-op for two players, but no multiplayer functionality was available to test at the event. Mercenaries is an interesting experiment as a stand-alone game and lots of fun for either short bursts or longer sessions, but it remains to be seen if blowing out what’s essentially a bonus mode into a main event can stand by itself. That being said, it’s one of the games we kept coming back to the most throughout the day and one we're eager to spend some more time with, if only to hold us over until Revelations. There was a piece of artwork released a while ago which had outlines of a few unrevealed characters, them being Barry, Wesker and Rebecca (I believe), which pretty much confirms this will have every character from 4 and 5 (Gold)'s Mercenaries mode (+ Claire). I hope they add more places, like the mansion or alexias island. But knowing Capcom, they will most likely not bother creating new things.... Well they can always reuse the places they used for the chronicles games. Idk, I think I'd rather have the other Resident Evil 3DS game. I agree this game looks really good, looks better than alot of ds and psp games even. It even puts a few Wii games to shame.Im seriously impressed with what the 3ds graphics are capable of. I don't know about this one, it's basically a glorified Bonus game. If it has RE5's 'VS' Mode than I'm totaly in. Vs Mode was incredibly fun in the beginning, it was just so weird and so un-Resident Evil haha. I'm actually intrigued by both RE's for 3DS. 3DS want list +2. Sounds and looks fun, though! He The only reason for getting this game. This should be good as long as the price tag isn't too high. The online cooperative should add quite a bit of replay value too. So far this sounds like the best 3DS game so far. Even though The Mercenaries may be a bonus mode of other Resident Evil games I think it will do well as a standalone title hoping there are more characters and more levels. I really like that you will be able to upgrade your weapons since it will add a little replayability to the game to see if you can slaughter more monsters before the time limit and the ability to shoot while moving is a great addition to the RE series. this is going to be cool!